I like my veggies to have a crunch. More so when the main food is Dal and chawal [rice]. 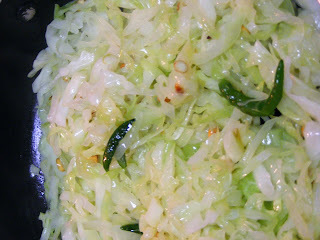 I particularly like to cook cabbage in a stir fry way with very little oil. The texture and the bite in this dish is just amazing. Simple Dal Rice and cabbage makes any meal a special one. Add a cup of natural yogurt and some salad on the side. Perfect.. Now where is my Pillow? 2 green chillies slit length wise. heat the wok. Add the oil. Add the green chillies, channa dal, curry leaves. Stir. Add the cabbage. Stir fry for about 3 minutes until cooked but crunchy. This timing would depend on how thinly you have sliced the cabbage. Add the salt. Stir a couple of times. Serve Hot off the stove. How about a take on Kashmiri Rogan josh and Matscch (lamb mince) ? Liked the color combo of your layout!